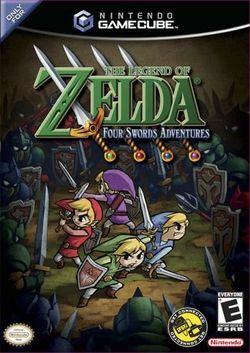 The Legend of Zelda: Four Swords Adventures is a multiplayer-centric entry in the famous The Legend of Zelda series. It follows on from the concepts introduced in The Legend of Zelda: Four Swords and adds a single player mode as well as many other features. The villain Vaati and the mythos of the Four Sword went on to become the focus of The Legend of Zelda: The Minish Cap. The story begins with the land of Hyrule being in a state of fear due to strange happenings that have occurred in recent days. On a stormy night, Princess Zelda and the shrine maidens fear that the reason for these events is that Vaati's seal is weakening. She summons Link and brings him to the castle so he can protect her and the other maidens while they open the portal to the Four Sword Sanctuary. When they do however, a dark figure appears from the portal. This figure was Shadow Link, who then kidnapped the shrine maidens and sealed them in crystals. Link follows him to the sanctuary where he retrieves the Four Sword to destroy this evil version of himself. When he does, Vaati is once again released and wreaks havoc on the once peaceful kingdom. As the game progresses, Link learns that the creation of his evil counterpart and the release of Vaati is only a small part in an insidious plot to take control of Hyrule. Things complicate as the dimension of the Dark World appears and people are being abducted throughout Hyrule. Link learns that not only have the knights of Hyrule mysteriously disappeared, but evil versions of them have been creating havoc. The castle has been taken over and monsters were appearing everywhere. It's revealed later in the game that the true villain is none other than Ganon, King of Darkness. He has stolen a powerful trident and used it to take control of parts of Hyrule. He stole the dark mirror and used it to create Shadow Link and then sent him to kidnap the shrine maidens and trick Link into releasing Vaati. Ganon wanted to gain control of as much power as possible and build up his army. To this end, he wants to take control of the shrine maidens' power as well as abducting people and sending them into the Dark World where they would become part of his army. Vaati, unknowingly, furthered his plans by creating monsters to add to his army. It is also revealed that the knights of Hyrule were murdered by Ganon and their souls were trapped in the Dark World where they became creatures of Darkness. Link eventually saves the shrine maidens, retrieves the Dark Mirror, destroys Shadow Link and Vaati, and faces Ganon in an ultimate showdown. Link defeats Ganon and seals him firmly in the Four Sword. Peace returns to Hyrule and the people celebrate as all traces of the evil that plagued Hyrule are vanquished.